Poet. 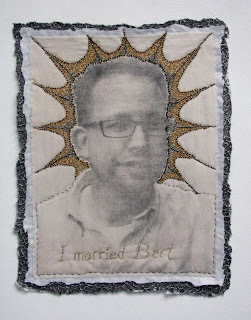 Stitched words: I Married Bert. 23 1/2" x 18 1/2". 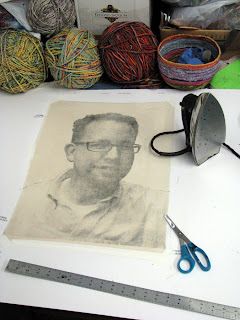 Xylene transfer on tea-stained muslin. Hand embroidery and beading. This is one of the first portraits I knew I wanted to create. Ed and Bert came to Artista Vista and saw my installation Decisions. I asked Ed right then if he'd pose for the new series. Immediately, he said "yes". Ed spent most of the summer doing research abroad and immersing himself with the Irish language; but, once home, he sent digital photos and I went straight to work. A poetic laurel wreathe would have been a bit "over the top" but I knew I wanted some sort of embroidery that would indicate the spiritual significance of a sacrament. I know that Ed and Bert's marital vows are just as important to them as are the ones Steve and I pledged to one another. Despite the fact that South Carolina doesn't recognize these vows, Ed and Bert made a life commitment....an important decision. I am so pleased to include this in my series and I'm quite happy with the result. By the way, Ed Madden's new book Signals is doing very, very well! I've been working on my newest piece in the "Decision Portrait" series. This one is called Poet. I was sent a digital photograph. 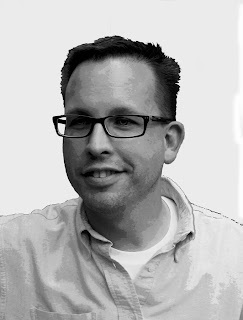 Using Photoshop, I cropped it, removed the background, desaturated it, heightened the contrast and flipped the image. Above is a small version of the result. Below are two, over-sized photocopies. I used the lighter of the two. Using xylene and lots of pressure, I transfered the photocopy ink into the tea-stained muslin. 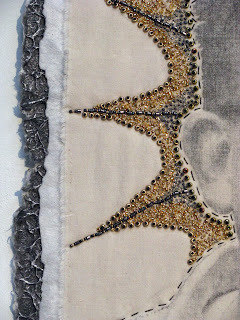 Next, the fabric was pinned to white felt and decorative paper that sort of looks like lunar craters. There are some straight stitches; but, otherwise, I've been beading ever since! Although I knew how I wanted this piece to look, I think the beading is a result of reading David Chatt: Two Hands, Twenty Years, and a Billion Beads. My friend Jeff Donovan actually got to see the exhibition currently at Penland. He bought the book and shared it. One of these days, I'm going to go to Penland....and I might never return! In the meantime, I'll dream about it while I bead! Generally I write about being far, far behind....deadlines looming and tasks piling up....but not TAST (Take a Stitch Tuesday)! 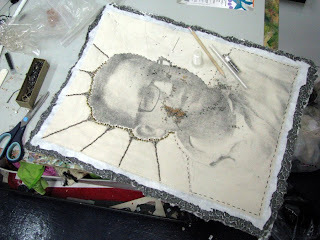 While I was in England I received a message from Embellisher in India who write "Million Little Stitches". She nominated me for this award. She'd been nominated by Paula of Beauty of Life. 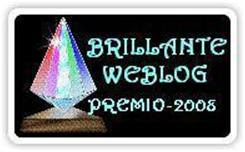 I really admire both these talented embroiderers and their blogs....so, of course, I'm going to post the award, link their sites, and list the answers to the interesting questions. 2.Five things on my to do list today. 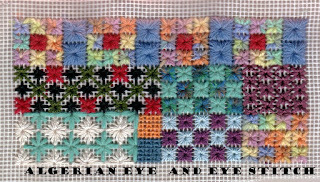 Finish the Algerian Eye stitch for TAST….yes, I’m behind! Pick up all the twigs, leaves, and limbs that blew into the yard after a storm yesterday afternoon….avoiding the downed power line which will hopefully get repaired soon! Cookies….the kind that can be dunked in tea…strong, plain black tea! Move into a large converted warehouse and create art all day when not traveling. Columbus, Ohio; Slippery Rock, Pennsylvania; Glanegg (on the outskirts of Salzburg), Austria; and currently Columbia, South Carolina. Now I'm suppose to name seven other blogs.....but if I don't get started on that "to do" list, I'll never get to the Algerian Eye Stitch! I'm skipping this part of the award. There are far too many brilliant blogs for me to name just seven. Anyone looking for inspiration can simply visit CYBER FYBER. There's hundreds of linked blogs....including "Million Little Stitches"...whose writer is somewhere in the jungle looking for TIGERS! Well, you know I'll be checking back to see how her weekend adventure went! Chevron Stitch and another review! I can't believe it but I'm already behind on my TAST challenge....but I'm about to catch up! 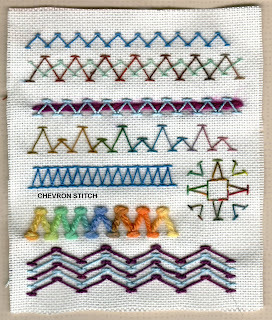 Here's the Chevron Stitch. I really liked this one and am planning to use it on Crazy Blues. It was happenstance, says director Allen Coleman at the Pickens County Museum of Art and History, that brought together the museum's current exhibition of works by Victoria Blaker, Glenda Guion and Susan Lenz. He picked three artists, he says, whose works are very different but also complementary. 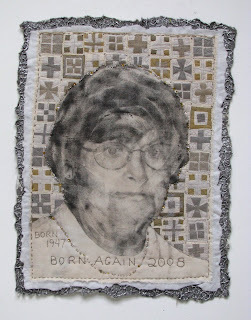 Lenz, a Columbia-based fiber artist, belongs to a 13-member group that exhibits at a gallery on Lady Street twice a year along a related theme. Two years ago, it was "the blues," she says, but not necessarily about blues music. Nevertheless, that's where Lenz ended up with her installation, "Blues Chapel." Shortly after the "blues" theme was picked, she happened to visit the nation's capital and its National Museum of Women in the Arts. There, she viewed photographs of early female blues singers. Recorded music and brief biographical texts accompanied the photographs, and by the time she got through the show, she says, she "got" what the blues were all about. "These were ladies who worked and lived in hard times. 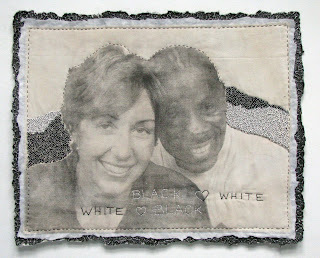 They were primarily black, living in the segregated South, and culturally, as women, they were second-class citizens." Included among her blues heroines are Bessie Smith, Billie Holiday, Ruth Brown, Sarah Vaughn, Anita O'Day and Koko Taylor. Lenz's installation honors 24 vocalists depicted as martyred saints with halos. 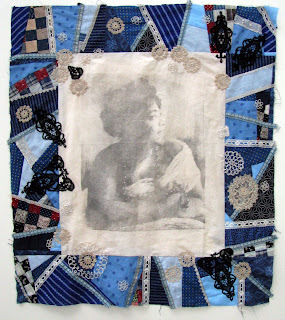 The mixed media group, framed in a traditional block pattern quilt, is heavily ornamented with embroidery, lace, beads, buttons, costume jewelry, paint, paper collage and hand-gilded gold. To create the "chapel feel" and elevate the religious theme further, the artwork is complemented by music, candles, drapery, church pews and a floral altar where viewers are invited to pay their respects. Steve and I went to England for almost a week. We've returned and I've posted three blog entries about the journey on My Family Blog. Part One.....The problems of flying and the Manchester Museum. 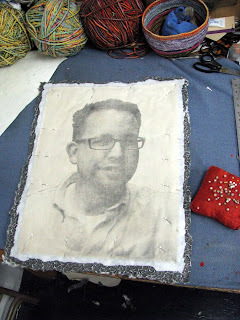 I try to keep most of the entries on this blog about textiles, art, stitching, creative inspiration....basically, a journal of my creative life. To this end, I've included some photos here that fit the bill! 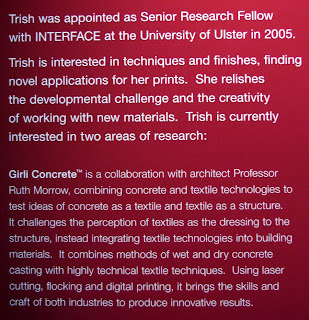 The picture above isn't particularly great but shows a piece of lacy fabric embedded into Girli concrete. The artist who made this is Trish Belford. Below is a sign that accompanied the work. Since then, I've found a blog with too much information for me to absorb.....but, one day, I plan to visit. 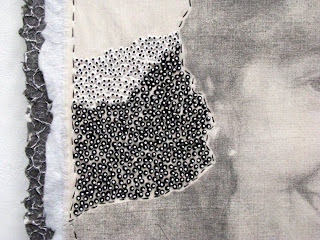 It is absolutely full of new ideas for textiles. 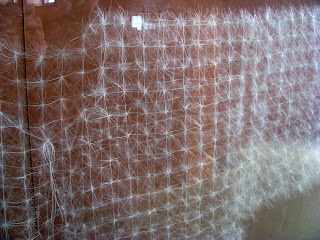 Nearby was a Plexiglas display case in which Adrian Bannon's Thistledown Coat hung. It was ethereal, meticulously made, and beautiful. Adrian Bannon's biography is here. These modern creations surrounded a large area of machinery, mostly late Victorian and early 20th century. A guide gave an impressive tour, ran all the machines, and made the visit more educational and entertaining than we expected. I posted images in "Part Three" (click link above). Of course I saw many antique embroideries like the banner below. 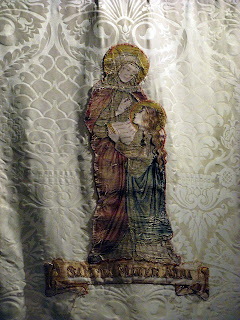 This hung in Buxton's St. Mary's Church. 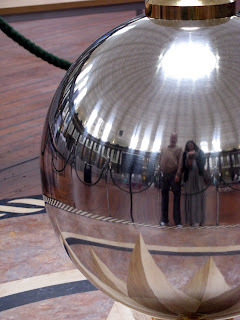 Also on this day trip, Steve and I went to Poole's Caverns, the Dome, the artisan center in the Pump House, a great old cemetery, and to Scrivener's antiquarian and used book shop. Click Part Two above for more images and details. I adored my time in the Manchester Museum too. 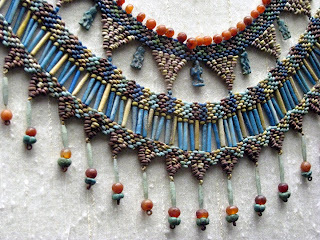 I've always been drawn to anything Egyptian and there was plenty to see, like this fabulous necklace. 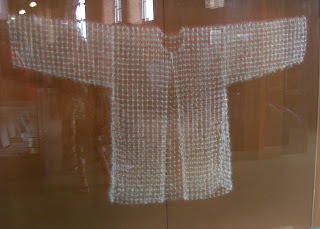 I didn't take any photos at the Whitworth Gallery this time (earlier images of the textiles are here on Flickr!) but found one of the exhibitions totally captivating. It was a solo printmaking show by Anne Desmet. Her use of architecture as a means of expression was outstanding. Her ability to take traditional printmaking to a new, complicated and modern level totally amazed me. All in all, it was a wonderful trip. Mathias danced beautifully. We returned with a day in Washington DC before Mathias flew in. Now, I'm back home....flooded with work but thrilled for the time away. The once mighty US Dollar doesn't go very far in England...or most other places...but there were plenty of flight problems on this journey. I lost my itinerary and had to purchase Internet minutes to retrieve them....hence, bloggin! My trip was delayed from the very beginning. Poor weather conditions meant the first flight wouldn't take off in time to make the connection. I was rebooked through London's Heathrow airport. Even my baggage was rebooked. Yet, by the time I arrived in Philadephia, the original flight directly to Manchester hadn't taken off. Every trans-Atlantic flight was going to be hours behind schedule...which meant I now was in danger of missing the connection from Heathrow to Manchester. Of course, I was rebooked on the 'original' flight...but not my luggage. I was told by just about everyone that my luggage to bound to the 'black hole' of Terminal 5 and might never be seen again. Despite this mess, I was in better shape than was Steve. His flight from Baltimore was so late that he missed that evening's last flight out from JFK. He ended up in NYC watching ABT's Giselle and spending an expensive night in a hotel...and coming into Manchester more than 26 hours late! I arrived with enough time to get to the Lowry to see the final part of the Stravinsky triple bill...the part of the program in which Mathias had a solo part in Card Games. It was wonderful. Mathias and I spent the time between this matinee and the evening show drinking coffee at a nearby Costa and catching up. He managed a 'staff ticket' for the evening show...so I got to see him in the other sections and also in another role for Card Games. It was a delight. Giselle was FABULOUS! ABSOLUTELY GREAT! We saw an evening show before seeing the matinee in which Mathias danced brilliantly in the first act's peasant pas. I was nervous but didn't cry....well, not too many tears anyway! I'll write more about all this later...with photos...but for now I'm spending many precious pounds on just a few minutes of Internet time in the Manchester Airport Marriott. Peacock Boxes. 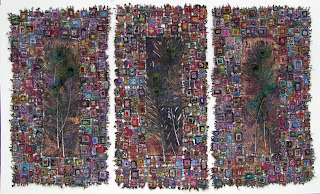 Fibers, feathers, and free motion machine embroidery. 30" x 52". I'm sort of scared of commissions. It's tricky to balance personal artistry with a client's desires. My mentor, Stephen Chesley, only takes "first refusals". So...if it's good enough for him, it's what I do too! Basically, if a client's idea is appealing, I'll do it. They are under no obligation to purchase it. I am under no obligation to make changes if it doesn't satisfy. The clients like my "In Box Series" but needed a specific....very large....size. They wanted me to add peacock feathers. The work is done. 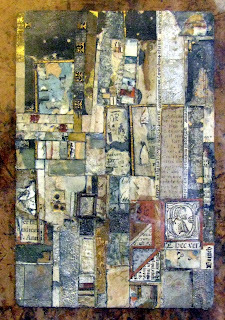 It will be part of an upcoming show at Gallery 80808....right outside my studio door. The show is called "80808 on 8-08-08". The resident artists are mounting this exhibition along with some of the former tenants. If the clients like it, they will have that opportunity before the show opens. It can hang with a "red dot" or be available for another art lover! The Olympics open that day too. 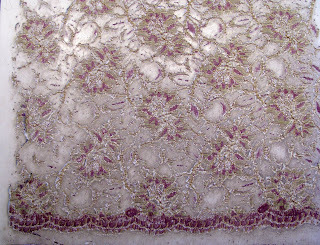 I'll be in SWEDEN at the embroidery symposium! The publicity for this show is due now, and I'm leaving from Manchester in two and a half hours (4 PM Tuesday!) Mission Accomplished! When I leave, I'll be taking Crazy Blues with me. I pinned on all these wonderful pieces of vintage crochet and tatting, trim, and scraps of lace. I've been stitching like "crazy" to get all the pins out before trying to go through airport security. Mission Accomplished! Time is an issue in my life. It is slipping by so quickly; I'll never have enough of it; Organizing it is a daily ritual. While busy with my new series and finishing a potential "commission", I knew I had to plan carefully. I can't take any of this with me on the plane to England next week. Also, my studio is now closed for a week. The gallery floors were in terrible condition. They needed sanded, primed and painted. 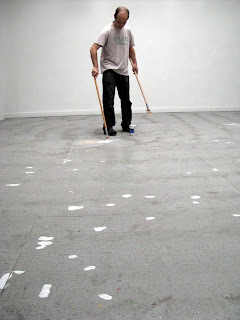 Below is a photo of my friend, the ceramist Jeff Donovan, priming the bare spots on the floor. So, I started a new project, a crazy quilt! It is perfect for all the stitches I've learned and will be learning through the TAST challenge! 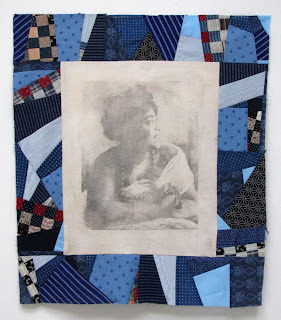 It's a crazy quilt with a xylene transfer of Mamie Smith. Mamie Smith was the first African American to record a Blues song....CRAZY BLUES. This is the newest piece in my "Decision Portraits" series. I am thrilled the way it turned out. It is the first one on which I added more than stitches. I was worried that the chiffon crosses would take attention away from the person and the words, but I really like how well this turned out. The wonderful lady in this portrait is none other than Veleta, also known as Sammy! I am privileged to share her recent baptism as an example of an important decision. I am even more honored to call her my friend and to have some of her incredible beadwork headed to the CYBER FYBER exhibition next January. 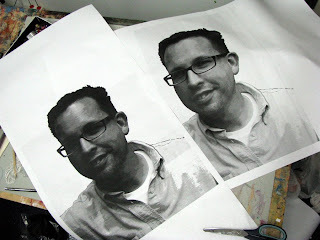 Sammy sent me the photo....so, if anyone is wondering how I might use their image for another portrait....don't worry! If you are considering it, a high-resolution image is all you need. Sammy's original photo had another person and lots of background in it. I used PhotoShop to wonderfully isolated the perfect picture! TAST and my first non-CYBER FYBER ATC trades! Serendipity plays a large and wonderful part of my life....even since going through Julia Cameron's book The Artist's Way about four summers ago. I guess it was always there, but I didn't seem to notice, let it in, and celebrate how "one thing just leads to another" in some sort of miracle fashion. Well, I got a CYBER FYBER request from a trader for her young daughter. I had to turn it down because I really don't want to get involved with securing private mailing addresses from under aged participants...even when I know it's "okay". To illustrate the decision, I mentioned that I didn't trade with my friend Doreen's granddaughter Ebony who has traded with dozens of stitchers. I suggested a non-CYBER FYBER trade but never heard back. Yet, this got me thinking about Ebony and we decided to trade. This is my first, official NON-CYBER FYBER trade. Doreen asked if we could trade too. Their wonderful cards arrived in today's mail. I'm not telling which one created which piece because they are both BEAUTIFUL and very sophisticated! Thank you both so much! 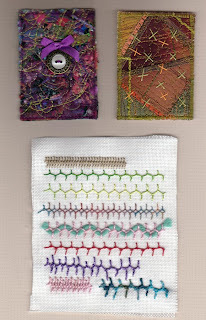 I scanned these trades with this week's TAST stitch....the Cretan Stitch, which I've seen at the Textile Museum in a show about historical Greek and Aegean embroidery...but have never done. It was fun! Although I started TAST just a few short weeks ago, I can say that "serendipity" must have been involved because I'm starting a new project that will involve crazy quilting. Yes, I know I have my "Decision Series" underway and am working on a commission...but I'm also going to England and need something for the trip! "One thing just leads to another!"